I had heard very good things about this book from a number of people whose scholarship and opinions I respect, so I was really looking forward to reading and reviewing it. Such a pity it didn’t pan out. 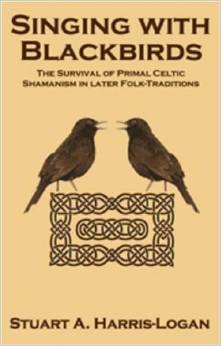 Singing With Blackbirds: The Survival of Primal Celtic Shamanism in Later Folk-Traditions is just what it says on the cover: one author’s attempt to sort through linguistic, archaeological, and mythical evidence to try to find proof that the ancient Celts practiced their own form of shamanism, which then survived down through the ages in recognizable form in folk tradition. This quest would naturally prove more difficult than others for two primary reasons: very little of pre-Christian Irish religious beliefs and practices have survived into modern times because they were an oral rather than literate society; and because what myths and stories we do have from those times and culture were recorded by Christians, who of course left out some parts and changed others in order to elevate Christian culture in favor of suppressing the pagan culture that came before it. This sort of historical and anthropological comparison is a standard practice in the field, and can work very well to bring new information to light, when properly and ethically done. The author considers any interpretations which do not agree with his own as “outdated” and “pretentious” (Logan-Harris, 122). However, it is worth noting that nowhere in the book, nor in any mention of the author’s qualifications, is it stated that he has formal training in anthropology, sociology, archaeology, or linguistics (though it is mentioned that he is a native Gaelic speaker). In addition to the above, what reliable evidence that is provided is scanty. I have mentioned that the Celts were a mostly oral culture, and that what survives of their folklore and history was written down by Christian monks, giving us a limited range of historical documents to paint the picture of their past. The number of those documents that the author draws on is even more limited, choosing to repeat, over and over, a small handful of selections from a very few texts, and trying to draw his conclusions from only the most fragmentary and tenuous of evidence there. Like building castles from sand, the conclusions drawn from that tiny pool of evidence do not stand solidly enough to rely on. While the idea of a primal Celtic shamanism that has survived into more recent times is a very beguiling thought, I do not find, from a reading of this book, that what evidence is available firmly supports that notion. I find this unfortunate, but for that reason, I cannot recommend it for those searching for material that provides more factual information on shamanism.